Ballerina Costume Pattern-Where To Find One? Today I happened to check on prices for ready-to-wear and custom-made ballet costumes. I was amazed at how costly some ballet costumes are! 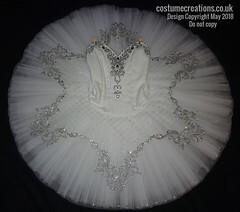 The most beautiful and highly embellished classical tutus can cost more than $1000 dollars to purchase. Not only are they expensive, it can sometimes take 4-6 weeks to receive the finished costume. At this point, ballet costumes are seriously out of the budget for most. 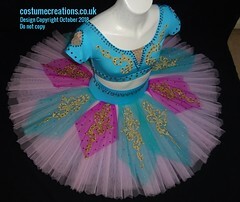 This is when desperation sets in and people think they can make something themselves using a ballet costume pattern. I decided to hunt around for ballerina costume patterns on the internet to see what was available. The search results were dismal. 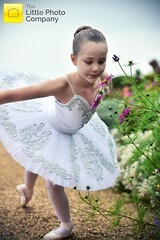 However, there are plenty of ballerina costume for little girls. I found them with names like Tinkerbelle, Fairy Queen, and Cinderella. Nowhere on the internet was I able to find a real, professional ballerina costume pattern for adults with a professional name like: Paris Opera Ballet’s Costume Patterns. I went 15 pages deep searching for any type of professional grade pattern and didn’t find a thing. So what does this mean? I would give it the same example as not being to afford a new car and therefore deciding to make your own car to save money. Unfortunately, it won’t work. The ballet profession is one of incredibly high standards. Professionally designed ballet costumes also have to meet those high standards. A person who intends to make a costume of velvet for instance, would have to spend a great deal of money on velvet yardage, cut it out perfectly, and know enough about velvet nap to make sure it runs the same direction on both sides of the garment. One mistake and that money and time go down the drain. There is a reason why professional-grade ballet costume patterns are impossible to find. It takes a professional ballet costume designer to construct them. The skill and dedication required to construct professional-grade dancewear can only be done by those talented few. 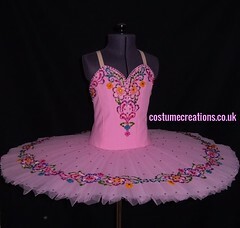 Yes, ballet costumes are surely expensive, but constructed in the hands of an experienced designer, the finished masterpiece will be worth every penny. 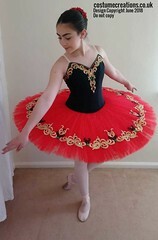 Previous Russian Tutu Design-Who Invented It? Thank you for such kind words – every costume has to be cut considerably differently for each dancer, and considerations have to be made for the style and choreography. Great care has to be taken on the fit of a bodice if the dancer is bending backward considerably. Equally great consideration has to be given to allow leg and back movement. All this has to be worked out whilst maintaining a tight fit. One has to have a great deal of experience to be aware of all these factors before you even start. Yes the fabric naps can cause a lot of difficulties too. Hi, I have been sewing classical tutus, which I custom make for the last fifteen years, its not just a matter of finding a pattern, different panels have to be cut on the grain of fabric in different ways and the skirt layers need to be pleated not gathered , some layers sewn against the others so they help support each other. It takes a minimum of 13 mtrs of tulle to make one skirt. If you want to try making one the best way to start is by having a good look at a professional tutu. 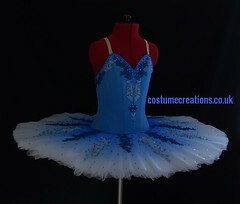 I have a basic pattern which I have made which I custom fit on each dancer. , I would be happy to help you by sharing it, but the sewing is very complicated and you need to be really good at it. 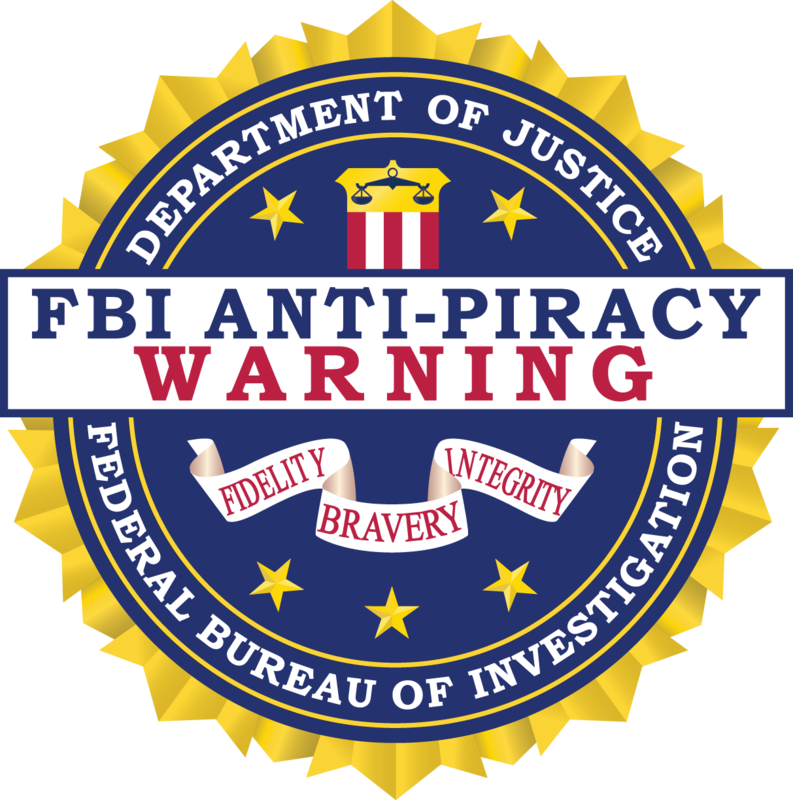 Perhaps you misunderstand the intent of this post and the purpose of this entire blog. 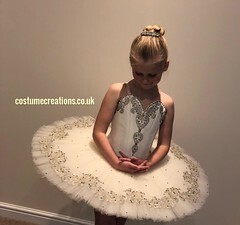 For one, I am only a writer providing insight and information to readers about one couture maker’s ballet costumes; specifically the tutus made by Master Theatrical Designer, Monica Newell for her established company, Costume Creations UK. I am not looking to make anything, let alone a professional tutu. 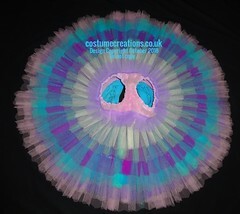 The tutus on this blog are not my creations. Although you are willing to “share” a pattern, only a fool would attempt such a thing if they needed a professional garment for a real ballet performance. This is exactly what the above post was explaining to readers coming in from the Internet searching for ballerina patterns online. I suggest you again read the part of the above post where it says, ” It takes a professional ballet costume designer to construct them. 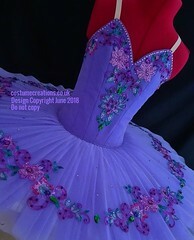 The skill and dedication required to construct professional-grade dancewear can only be done by those talented few”.